Normally I just stick to the regular long red Starbucks Christmas mugs but when I saw this for sale this year I just had to grab it. It’s a good size (a LOT bigger than my Gingerbread Men mug) and has a hand painted candy cane stripe on the handle (itself a very different design than the regular mug) and a glossed dark red interior making it essentially tea, coffee and cocoa stain proof! Since buying this mug, I’ve pretty much been drinking out of it every day this month. It’s quickly become my favourite mug! Hope you had a great Christmas and continue to have a safe holiday season! Thanks for commenting! It’s cool, right? Love it! I love your Starbucks mugs collection! 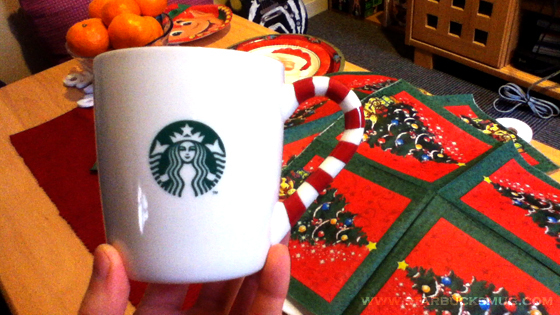 I’m the owner of the Starbucks Mugs page on Squidoo and I’ve added a link to your awesome blog!